This past weekend Uncle Earl and brother Steve worked for a few hours on the aluminum fishing boat. Steve and his son wanted to go fishing but the boat's transom had rotted away and needed to be repaired. They replaced the rotted wood, serviced the motor, launched the boat, and headed to the old fishing spots remembered from years ago. H.I. Peterson, editor of the Litchfield Independent, who established Stony Point Camp with his wife in 1901, owned the Launch, 'Jessie F.¹ Photo from Stony Point, by Frances Boyden, 1995. As I watched them leave from the dock I noticed the variety of boats out on Koronis: pontoons, speedboats, fishing boats, sail boats, canoes, and paddle boats with personal watercraft circling all the boats. Given the current variety of boats it is hard to imagine a time when boats were sparse both in number and type and boat traffic was nonexistent. As early as 1892 notations in The New Paynesville Press alluded to the frustration among people wanting to use Lake Koronis but being unable to secure boats. Two local citizens specialized in making boats in the 1890s. "Messrs. French and Hiatt are having a rush of boat making. Their principal trouble is in getting suitable lumber. When they have secured some that is just right they will make some boats that will be beauties." "French and Hiatt are making some more boats, on that handsome model so well liked by everybody. They are splendid workmen and make just as neat serviceable boats as any city factory." By 1901 several private parties owned some type of boat. 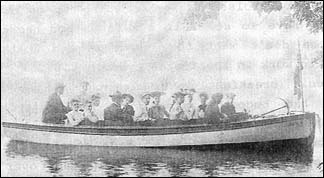 However, steamboats had become the only public transportation offered on the lake. "The business men ought to get together and plan some method for the purchase of a boat for Lake Koronis. While there will be several private launches on the lake this summer, the removal of Phipps' steamer leaves the lake without a public conveyance of any kind." In the late 1890s and early 1900s sailing became a popular leisure activity. "Hub Haines is constructing a sail boat for M. S. Elliott and W. H. Huntington that the owners believe will out-sail any craft that ever disturbed the placid waters of Koronis. It is equipped with sufficient air space so that in case of an accident it cannot sink." Five months later the news of the launch of the sailboat made the newspaper. "Mayor Huntington and M. S. Elliott launched their new sail boat, christened 'Red Wing,' in Lake Koronis on Saturday of last week. It is claimed to be an unusually fine boat." 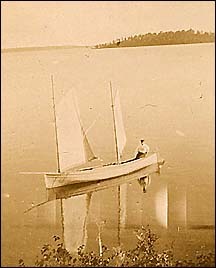 In the late 1890s and early 1900s, sailboats began to be seen from the shores of Lake Koronis. Photo from collection at Paynesville Area Historical Society. Two years later, in 1904, Huntington and A. L. Elliott purchased a 30-person capacity sail boat from Ole Mosness of Litchfield. Kept on the east end of Koronis, the boat was rarely seen in open water although Huntington had the reputation of being a safe sailor. Gasoline launches came on the scene in 1904. "The 'Jesse F.' is the name of a handsome new gasoline launch now in commission on Lake Koronis. She is the property of Editor H. I. Peterson of Litchfield." Peterson and his wife, Jessie, had built their summer home on land at the east end of Koronis in the area known as Stony Point. W. A. Huntington also owned a launch and one of his excursions was recorded in the New Paynesville Press. "W. A. Huntington's launch was out last evening with a party from town consisting of the Misses Grace Lawson, Anna Kowe, Nina Chisholm, Messrs H. H. Holifer, Ira Curtis and C. C. Peterson." Hub Haines was another local boat builder noted for his craftsmanship. On three occasions in 1905 his work was addressed in the Press. It was reported that he had most of the work completed "...on a small gasoline launch and it was the equal of anything turned out by any of the big boat factories. It will be equipped with a single horsepower gasoline engine. If the boat meets with Mr. Haines' expectations he contemplates making several more of a similar pattern, which he will place on the market." "Hub Haines launched one of his new gasoline boats last week. It is very small but gets through the water with the best of them and is just the sort of a craft needed for fishing parties." "W. A. Huntington placed his new launch in Lake Koronis last week and gave many of his friends a ride Sunday. The new boat is 20 feet in length, equipped with a five-horse power gasoline engine and is as neat and swift a little vessel as one could wish to ride in. It was built by Hub Haines." Boat type and quantity have changed over many years on Lake Koronis. Boat craftsman French, Hiatt, and Hub Haines might be surprised at how their craft has evolved. Their starts in supplying Koronis with leisure craft have led to thousands of people being able to enjoy a view from the lake. Information for this column was taken from the following issues of the New Paynesville Press: June 16, 1892; July 7, 1892; August 25, 1901; February 12, 1902; July 2, 1902; May 12, 1904; July 21, 1904; March 30, 1905; June 1, 1905; July 4, 1905; July 11, 1907.